I bought a pair of red Air Jordans for $185. I’m supposed to have swag now. But I don’t feel any different. So the next day I buy a red Cleveland Cavaliers hat to match. I’m not sure what sport they play. I think baseball. Right? They’re called baseball caps after all. Yet despite my matching swag, women still ignore me. Swag. I got both my ears and right eyebrow pierced. Was it a left or right piercing that meant you were gay? Well, now that my eyebrow’s infected I better have swag. Speaking of which, maybe what I really need is better swag? I bought a shiny Gucci watch to blind any haters. Perhaps the problem lies with me? Now I walk with a lean and drop the “g” at the end of words like “wiling”. But it’s not wilin’ enough. 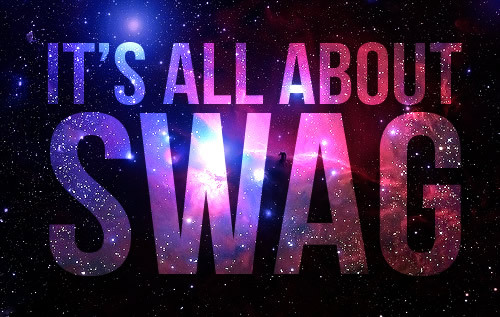 Maybe swag is how you see the world? I bought a pair of shades by Ray-Ban. Now I’m almost broke. While crossing the street, I got hit by a bus. Now I’m rockin’ a casket. Do I have swag now?